OOSA scout tickets/reports are coming to GOMsmart. 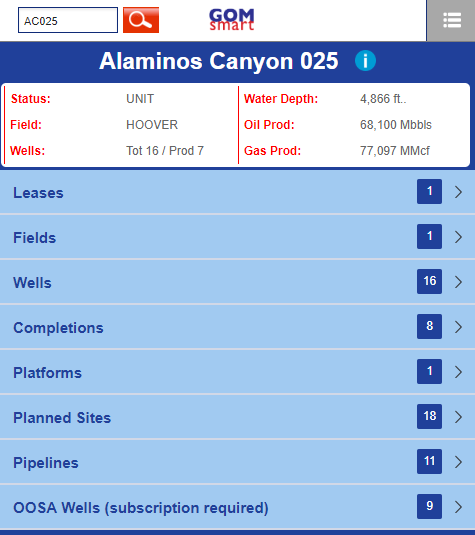 Like other datasets on the main page, individual wells will be clickable to access scout tickets or other downloads. More information will be coming soon as new security options (most likely a verification email) are created to ensure the privacy of OOSA's data. A few improvements have been made to the Tie-back Tool this month. Originally, the processing of the route created issues in the order of operations that could violate the maximum allowable slope, but those issues have been solved. The map colors in the report have been altered to make the route more visible in the highlighted origin block. The output reports now include annual production for the target platform and a list of the platform's wells (with last production date), when the route is tying back to a platform. 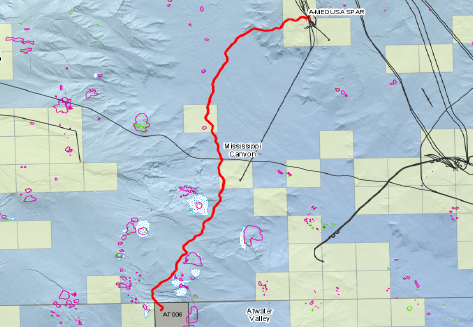 Finally, as a reminder, the tool now allows a custom Lat/Lon location for both the origin and destination, essentially making it possible to map pipeline routes anywhere in the Gulf. New layer files have been formatted to improve the display of numeric data in attribute tables. Rounding to whole numbers (when appropriate) and the inclusion of thousands separators at long last should make reading and comparing numbers much better. Also, new Atlas data will be integrated at the start of December. This means that new outlines and attributes will be available for sands, pools and fields, along with updated 3-D shapes for sands. ArcGIS 10.6.1 is now officially supported for GOM3. While ArcGIS 10.2.x is still technically supported, 10.2 support is coming to an end, with a planned end date of February 28, 2019. Please contact us if there are issues upgrading beyond version 10.2.